After all the hard work of planning an unforgettable wedding, you deserve an equally unforgettable honeymoon escape. Whether you want to retreat to a secluded island paradise, relax at a spa, explore ancient temples and ruins, or try exhilarating water sports, there’s something for every couple, whatever your tastes. There are beautiful exotic islands, lively cities and picturesque villages that make the perfect backdrop as you watch the sunset and dine under the stars. To help you choose the getaway of a lifetime, we’ve pulled together 10 of the top destinations for newlyweds. For a magical, once in a lifetime adventure full of cascading waterfalls, sandy beaches, tropical wildlife, soaring volcanoes and beautiful sunsets, jet over to Hawaii for your honeymoon. Learn to hula dance, swim with dolphins, take whale-watching cruises and drink cocktails at lively luaus. In the gloriously hot weather, you can take it easy and relax with luxury spas and championship golf courses or go all out and try exciting activities like surfing lessons and scuba diving. Say ‘aloha au ia oe’ in one of the most romantic places in the world. For a secluded island paradise, the Maldives is perfect for newlyweds with each resort sitting on its very own tiny island. Wake up to incredible sunrises from the iconic overwater villas or secluded beach villas for a romantic start to the day. End the day with a candlelit dinner under the stars. Explore turquoise lagoons, coral reefs and golden beaches, or try world-class snorkelling, exhilarating water sports or visit uninhabited islands for a more active honeymoon. The islands are at their hottest from November to June, but the summer is still a warm 32 degrees, just with a chance of rain. There are all kinds of experiences to be had on a honeymoon in Thailand. From the vibrant city of Bangkok to the beautiful beaches of Phuket, you’ll find a tropical climate, colourful nightlife, floating markets, peaceful temples and idyllic beach resorts. It’s the perfect honeymoon for couples looking for travel, adventure and discovery, so you can either backpack your way through together or stay at luxury resorts. Head to the north to explore the jungle, take in the breath-taking scenery, spend time with elephants and visit authentic hill tribes for a taste of their culture. This playground for the rich and famous is a great place to honeymoon with its white sands and tropical valleys. The luxury resorts pamper you, so you can do nothing but sunbathe and take a dip in the sea. Or, if you’re looking for an action-packed honeymoon, there are plenty of exciting activities to do like hiking up an extinct volcano, scuba diving for the best views of the untouched coral reefs or parasailing over the lagoon. If you’re after culture, there’s vibrant and lively markets and fascinating museums to explore. It’s also the perfect location for island hopping to experience more of the French Polynesian islands. Italy is both a beautiful and fascinating destination to honeymoon in. Lovers of delicious food and world-class wines will be spoilt for choice enjoying authentic Italian cuisine. There are so many different places to explore, each with their own little quirks. Spend some one-on-one time in a secluded villa in Tuscany, taking walks over the rolling hills, or take a romantic gondola ride through the streets of Venice. Explore Verona, the home of Romeo and Juliet, or Sardinia for its white-sand beaches or Rome, for a city known for its romantic spots and hidden gems. It’s the perfect place to mix culture, food and stunning sights. Watch the sunset go down from the white-sand beaches of Mauritius as the turquoise waves gently lap the sand. It’s a stunning island to escape to for your honeymoon, with volcanic mountain backdrops and beautiful waterfalls like the Tamarind Falls where you can take a cooling dip after a hot day in the sun. Go on a deep-sea fishing expedition and see the incredible coral reefs for yourself, head to the colourful markets selling spices and tea leaves, and then dine at mouth-watering gourmet restaurants. For adrenaline junkies, experience the thrill of a zipline adventure or tandem skydive from 10,000ft. Honeymoon in the ‘Island of the Gods’, as Bali is known, for incredible sights of lakes, volcanoes, vibrant jungles and rice paddies. The welcoming culture and tropical monsoon climate meet you as you step onto the tranquil island. Stay in architecturally stunning luxury hotels, resorts and private villas as you explore this culturally rich destination. Take a trip to Ubud and experience their famed art, craft and carvings, or watch one of their daily performances including the traditional dance shows. The pristine white-sand beaches are great for relaxing or snorkelling and make for a romantic backdrop to your honeymoon. Sri Lanka is a great honeymoon destination for combining adventure with deep relaxation and spirituality. Known as ‘nature’s treasure chest’ there are incredible jungle views, ancient Buddhist ruins, fascinating wildlife, vibrant green tea plantations and miles of sandy coastline. Go backpacking, surf, go on a safari or head to Minneriya National Park to meet Sri Lanka’s famous elephants. After a long day of exploring, chill out at an extravagant resort and indulge in some of the best spa treatments as the sun goes down so you can truly connect with each other, and yourselves. One of the most popular honeymoon destinations is, unsurprisingly, Greece. The Greek Islands are known for their breath-taking beauty and rich history, with fantastic sights like the Acropolis and Parthenon. 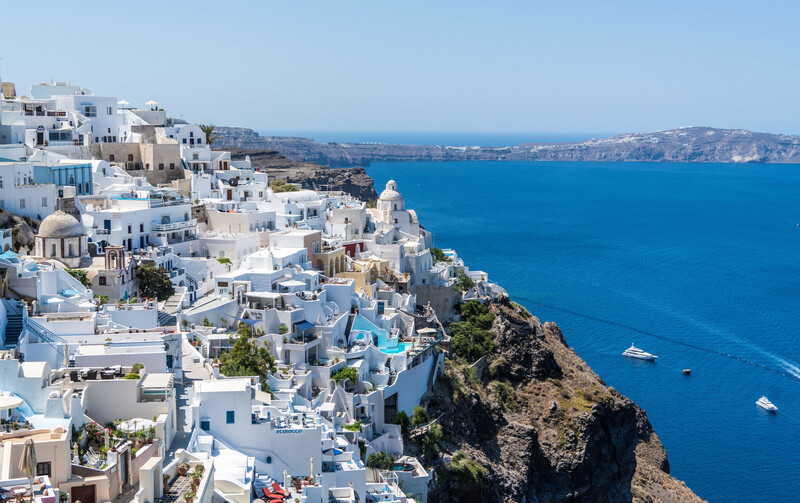 It’s perfectly designed for island-hopping newlyweds, to experience everything Greece has to offer from ancient archaeological sights to hiking, swimming with dolphins and even skiing. For relaxation, take a trip to the resort spa, or take it to another level and enjoy one of the many natural thermal and mineral springs. No Greece honeymoon is complete without a trip to the incredibly romantic Santorini. For delicious local cuisine, luxury resorts and plenty of cocktails, choose Mexico for your honeymoon. The sandy shores, hidden coves, lagoons, underground rivers and beautifully clear waters are perfect for a romantic, coastal retreat. The wildlife makes it a place worth exploring, meet spider monkeys and turtles, swim with dolphins or head to the Belize Barrier Reef, the second longest in the world, to experience the vibrant marine life for yourself. Take a trip to ancient Mayan ruins or enjoy Cancun’s world-class nightlife and party till the sun comes up. These are just 10 of the best honeymoon destinations this summer, but there are plenty of notable mentions like Seychelles, St Lucia and Cambodia. And of course, if popular honeymoon destinations aren’t your thing, and you’re more of a city-holiday couple, don’t be afraid to be different and choose the location that best suits you. Honeymooning in Barbados: Top Picks! 2016 Honeymoon Trends: Where Will You Go?